Apologetics Press - Do You Find R&R Helpful? Do You Find R&R Helpful? If you are an avid reader of Reason & Revelation, and have found its articles to be faith-building, stimulating, and timely in sorting out the pressing scientific and cultural issues of our day, we sure could use your help. In order to maximize our resources and efforts, we need to expand our list of subscribers. Perhaps you have friends, family, co-workers, or fellow church members that would benefit from the useful articles and scholarly research that goes into every issue of R&R. You could perform—for both them and A.P.—a real service if you would urge them to subscribe. We are living in critical times. With every passing day, it seems as if the Christian value system on which America was founded suffers multiple attacks. A relentless barrage of hostility continues against Christian morality—from the incessant clamor for homosexual rights to the ongoing struggle to rescue the unborn from the abortionist’s instruments of torture. Christian sensibilities are assaulted on every hand, at every turn, on a daily basis. Anti-Christian encroachments are so widespread that they seem surreal, leaving the Christian bewildered at how such hedonistic forces could have gained so much ground. What is the solution? The truth—God’s truth, the Gospel. The key is getting God’s views out to people. And that is precisely what A.P. has endeavored to do for 28 years and counting. 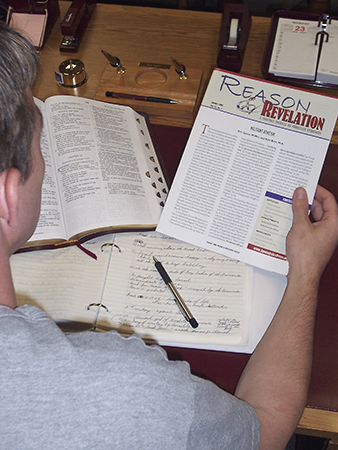 Reason & Revelation is one of the tools we are using in an effort to combat the sinister forces of unbelief. But it is effective only in the hands of readers. So many other forms of communication are vying for people’s attention. Whether they are exposed to the kind of faith-building substance that R&R provides depends significantly on whether a friend or co-worker cares enough to introduce the magazine to them. Here is an easy form of evangelism that anyone can do. Why not give an R&R subscription to someone today? Take a few minutes and think of individuals who would benefit from this publication. We will be happy to provide sample copies and subscription forms on request. Keep in mind that subscriptions as gifts to friends, co-workers, and acquaintances is a great way to introduce people to many biblical and scientific truths.